This article covers general information related to magnetic interference. Magnet Interference on a compass can have a serious impact on navigation on all vehicle types. This article explains what hardware changes you can make to reduce magnetic interference on the compass, along with supporting theoretical discussion. Information on how to set-up your compass can be found on Advanced Compass Setup. The best way method is to use an external compass or GPS+Compass module mounted on a mast up and away from magnetic source of interference including the power distribution board (PDB). Keep the wires between the PDB, ESCs and battery as short as possible. The wires from the ESCs to the motors are less important because they are AC and produce less interference. Twist the wires between the PDB, ESC and battery and use grounded shielding where possible. 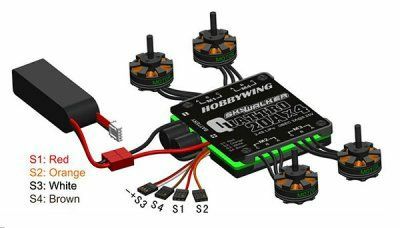 Replace the PDB and ESCs with a 4-in-1 ESC because they tend to poroduce less interference probably because their wires are shorter and closer together and they also have an aluminum plate on top which may help reduce the interference. Add aluminum shielding (even gutter tape) around the wires from the ESC to the motors may reduce the AC interference. Aluminum will not help reduce the primary DC interference from the PDB, ESCs and the wires connecting them. The application of the Biot-Savart law on the centerline of a current loop involves integrating the z-component. In the case where you have a PDB and 4 ESCs you have 4 loops that start at the Deans connector on the PDB, go out to the ESC and return back to the Deans connector. In the case of the 4 in 1 ESC the current flow is much more concentrated in one area and you don’t have the big loops so consequently you decrease the magnetic field. Where there is the option, you can deliver the same power and decrease the magnetic field by increasing the voltage and decreasing the current. There is one more thing and that is that the direction of the magnetic field depends on the direction that the current flows so when you rotate a battery it changes the magnetic field produced by the current flowing in the battery. It can’t be stated enough that minimizing the enclosed loop areas and moving the compass away from the current will help things work better and “yes”, power distribution boards with big circular thick high current PC traces on them produce significant semi-spherical fields as large or larger than their diameter. The following information has not been objectively tested to determine it’s impact on a vehicle’s compass accuracy in flight. Steel framed or reinforced concrete buildings, bridges and roadways, iron pipes and culverts, high power electric lines, heavy equipment, trucks and automobiles, steel tanks, electric motors and even computers. Flying between steel framed or reinforced high rise buildings will distort the magnetic field in addition to causing GPS multi-pathing. 6” (15 cm) minimum: Metal rim glasses, pen/pencil, metal watch band, pocket knife, metal zipper/buttons, belt buckle, batteries, binoculars, cell phone, keys, camera, camcorder, survey nails, metal tape measure. 18” (50 cm) minimum: Clipboard, data collector, computer, GPS antenna, 2-way radio, hand gun, hatchet, cell phone case with magnetic closure. that use a magnet to hold the stylus. 15 ft (5 m) minimum: Electrical box, small car/truck, powerline, building with concrete & steel. 30 ft (10 m) minimum: Large truck, metal building, heavy machinery.